Originally painted as a book cover for 'The Tantric Distinction - An Introduction to Tibetan Buddhism' by Jeffrey Hopkins, (Wisdom Publications, London, 1984), this portrait painting depicts the face of white Vajrasattva (Tib. Dorje Sempa) with his red consort Vajra Garvi (Tib. Dorje Nyenma). At that time this book cover was deemed to be somewhat 'unorthodox' by a few Tibetan scholars, as this was only a portrait rather than the full traditional image of a deity. However, times really have changed much since then, and I feel this illustration still has a graceful and peaceful presence. 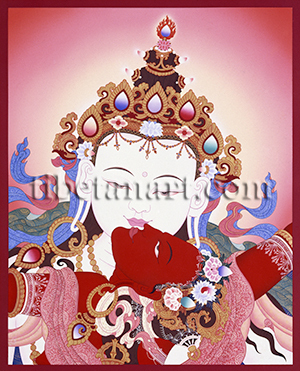 White Vajrasattva and his red consort Vajragarvi each have two bow-shaped eyes and two arms, with Vajrasattva holding the right-hand attribute of a golden vajra in front of his heart, and a silver bell at the level of his left hip. In sexual union she presses her body to his, as she sits upon his lap in lotus posture with her legs entwined around his waist, and their lips almost touching, as shown here. Vajrasattva wears the the five divine silk garments and eight jeweled ornaments of a sambhoghakaya deity, while his consort is adorned with gold ornaments and the five filigree bone ornaments of a dakini or tantric goddess. Half of her long black hair is piled up into her tiara and topknot, while the other half flows freely down her back. The vajra-topped eight-spoke bone wheel at her crown has thirty-two loops of filigree bone hanging from it, which represents the thirty-two psychic channels that emanate from the crown chakra. Both deities wear five-jewel crowns or tiaras, with the five colours of the jewels symbolising the 'Five Buddha Families', with the jewel of white Vairocana at the centre, blue Akshobhya in the east, yellow Ratnasambhava in the south, red Amitabha in the west, and green Amoghasiddhi in the north.